Jennifer Carter has called Sulphur Springs home since middle school and enjoys serving the community she grew up in and surrounding communities. She is deeply committed to women's health, obstetric care and preventative health care. Jennifer received an associate degree in nursing from Tyler Junior College before obtaining her BSN from Grand Canyon University. Her MSN-NP is from Frontier Nursing University where she is currently pursuing a doctoral degree in nursing practice which will allow her to become a professor of nursing studies and encourage other budding nursing professionals. Jennifer also holds a Texas Region 8 teacher certification. 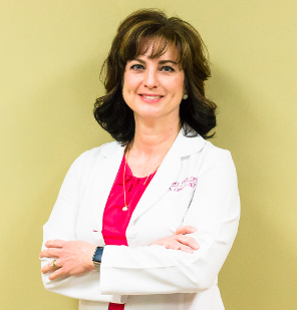 Jennifer has over 27 years experience at Hunt Regional Medical Center working in labor/delivery, well newborn nursery, postpartum and Level 2 NICU departments. Jennifer has been married to Steve for more than 20 years and her three adult sons are living happy and successful lives. Her hobbies include running, golf and cooking. Jennifer loves to teach high school students and Bible studies. Jennifer and Steve attend First Baptist in Sulphur Springs and support various missions/missionaries around the world.